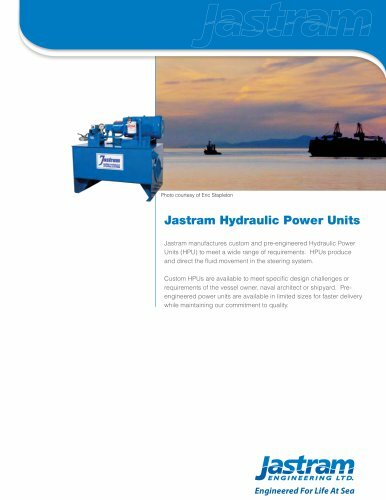 Photo courtesy of Eric Stapleton Jastram Hydraulic Power Units Jastram manufactures custom and pre-engineered Hydraulic Power Units (HPU) to meet a wide range of requirements. HPUs produce and direct the uid movement in the steering system. Custom HPUs are available to meet specic design challenges or requirements of the vessel owner, naval architect or shipyard. Preengineered power units are available in limited sizes for faster delivery while maintaining our commitment to quality.